I was invited by the Society of Critical Care Medicine to speak about my book and discuss the personal impact of sepsis and its multi-dimensional challenges, and to participate in two days of discussion groups about Post Intensive Care Syndrome. Task groups addressed Education and Awareness for patients, families and clinicians, Research Gaps priorities, resources, and funding, and Barriers to Practice such as access, reimbursement, and advocacy. I worked with the Education and Awareness task group discussing improving long-term consequences after discharge from the ICU, including the development of post ICU brochures, critical illness survivor videos for use on YouTube, and internet resources about PICS. 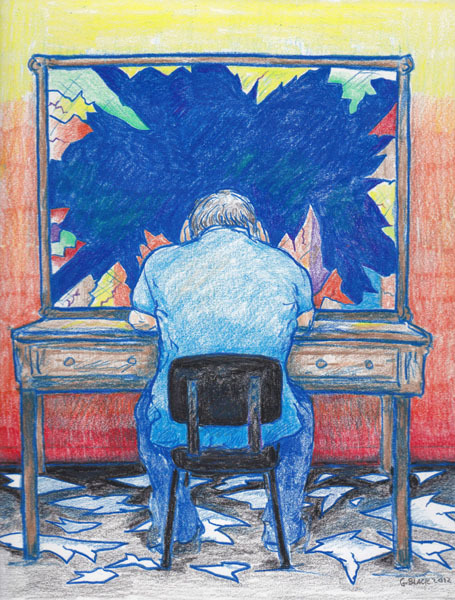 I contributed a drawing titled: "The Aftermath" as a handout that represented what a critical care patient feels when they get home and face that time period beyond acute care hospitalization, where fear, challenges and limitations collide and can become a devastation, or altered quality of life. 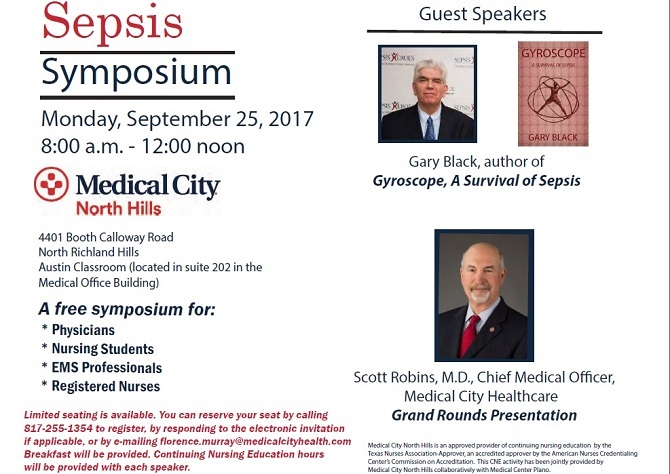 Here is a video of my 25 minute presentation about my book Gyroscope and the personal impact of sepsis. Here is a video of my brief interview with the Society of Critical Care Medicine (SCCM) about the impact of critical illness and the challenges in the aftermath. This drawing was introduced at the Post Intensive Care Syndrome (PICS) Stakeholders Conference at The Society of Critical Care Medicine on Sept. 24-25, 2012. It is a self-portrait representing the impact of physical, cognitive, and mental health problems I have faced after sepsis and hospitalization, and how I felt afterward. This drawing has been published, along with my commentary in American Nurse Today, May, 2013, Volume 8, Number 5, where I was privileged to be the first non-nurse to co-author an article in the magazine. I worked with Judy E. Davidson, Maurene A. Harvey, and Jessica Schuller. I spent Dec.7-9, 2012 in Boston. 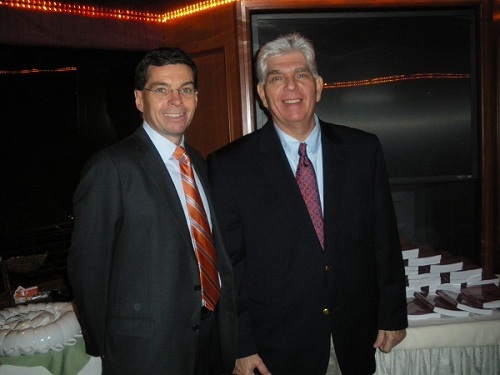 I was invited by John McDonough, the CEO of T2 Biosystems to speak to his entire company about sepsis, my book Gyroscope, and the very important potential role of their new early diagnostic medical instruments that are capable of identifying bacteria, fungi, etc in TWO hours instead of waiting for the old gold standard of blood cultures that take days to complete. My wife Nancy and I had an opportunity to see this equipment up close, and to talk with scientists and engineers working in their lab. It was a great experience. It is simply amazing, and offers HOPE for future sepsis patients, especially since delaying of antibiotics increases mortality rates by 7.6% per hour. Their sensitive, accurate (99%), rapid and versatile diagnostic platform uses magnetic resonance imaging and nanotechnology that may be a real visionary game changer in the near future. They are starting clinical trials for Candida in January, 2013. Wolters Kluwer Health is a leading provider of information for professionals and students in medicine, nursing, allied health and pharmacy. Their mission is to provide current, accurate and expert information, leading edge technology and solutions, and superior customer services to help current and aspiring health professionals make critical decisions effectively and efficiently. "Breakthroughs" is an award winning organization in the educational television industry. The "Breakthroughs" series is "hosted" by television and feature film actor Martin Sheen and specializes in interstitial programs that are "short form" editorials lasting three to five minutes in length and are used to bridge the gap between longer Public Television programs. Each story is compelling and packed with critical information that will enrich the viewer's experience and provide expansive knowledge on the latest advancements impacting our lives, such as with our story on sepsis. I was privileged to work on this video with Sean Benson, Vice President of Innovation at Wolters Kluwer Health, Clinical Solutions, and Dr. Jim O'Brien, Chair, Board of Directors, and medical advisor with the Sepsis Alliance. Read more about Wolters Kluwer advances in sepsis mortality reduction through the POC Advisor implementation. Sepsis Heroes Awards is an annual event celebrating champions of sepsis awareness. This event, created and promoted by the Sepsis Alliance, draws attention to people and organizations that are working hard to help raise awareness of this often devastating disease. It was an honor and a privilege to be recognized and receive this award along with Governor Andrew Cuomo, New York State, GE Healthcare Education Services, David Goldhill, Mark Lambert, and the Surviving Sepsis Campaign. This was an important part of my acceptance speech. To those of you who have lost a friend or loved one, and to the families that endured pain and suffering with them, my heart goes out to you, and I hope you find comfort knowing that there are people and organizations like the Sepsis Alliance that are making every effort to reduce suffering and save lives. To those of you who have survived sepsis and then bravely gone forward in its aftermath to overcome your mental, physical, and spiritual challenges to regain balance in your life: I truly admire your courage and strength. To those of you who dedicate any or all of your time, donations, and talents towards sepsis awareness, education, treatment, management and research: I thank you from the bottom of my heart. To the doctors, nurses, therapists, and other healthcare workers who work daily on the battleground of sepsis in Emergency rooms, ICU's, and hospital departments: I salute you! 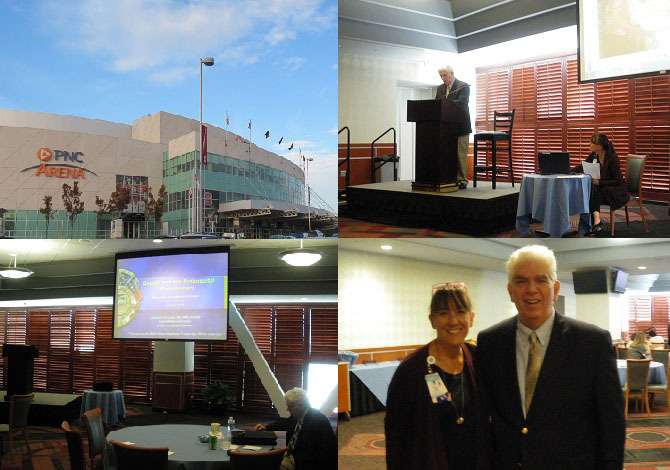 I had the privilege to be the guest speaker at the Clinical Nurse Council at Wake Med Cary, N.C. conference center. I shared my sepsis experiences from a patient's perspective with about 80 bedside nurses who give direct care to patients throughout the Wake Med continuum. The theme for the day- long event was: Infection Eradication. The agenda combined a variety of speakers. 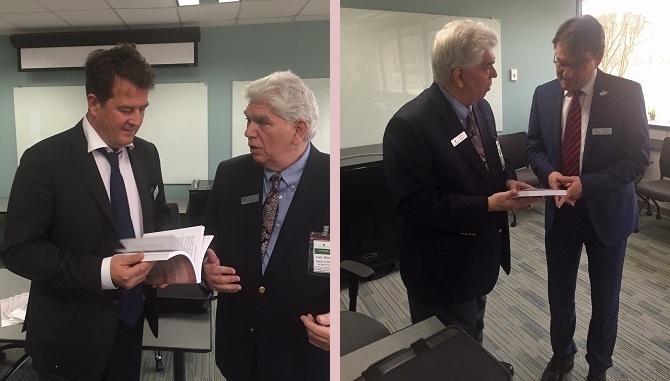 Dr. James J. Cappola III preceded my presentation with a one-hour discussion about sepsis, and various scenarios for identifying and treating sepsis. I shared my story about surviving sepsis, and all that I have endured, and thanked Wake Med nursing staff for their compassionate nursing care that made a difference in my recovery. They are a serious group of professionals dedicated to advancing their standard of excellence. I especially thank Helen Voss, Elaine Rohlik, and Pam Wolfgang for their warm welcome to this event. 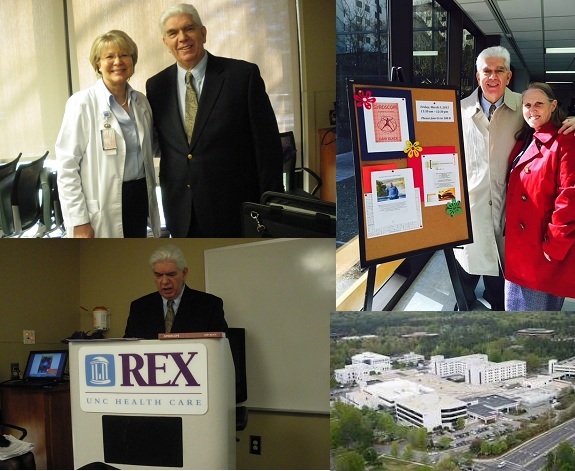 I was privileged to be invited by Helene Zehnder, Medical Surgical Nursing Magnet Program Director, to share my experiences as a sepsis survivor with the Rex Hospital nursing journal club session about sepsis. First, Mary Clare Prasnikar gave a presentation with a complete overview of sepsis, then Ginger Lorenzi gave me a warm introduction to the group. Nurses were assigned an article titled: "Surviving Sepsis: The Role of the Nurse," and required to attend the entire hour to get credit. I gave the group a presentation of "sepsis from the inside out," a patient's perspective. I described the physical, mental and spiritual impact of this devastating illness, and shared my book content and art work, discussed various aspects of sepsis-associated delirium, and the challenges in the aftermath of sepsis after hospitalization. I especially thank Helene Zehnder, Ginger Lorenzi, Mary Clare Prasnikar, and Deniz Ender for their warm reception to this event. I was invited by Shae Earles, RN, EMT-P/EMS nurse liaison to speak at a Rex Hospital mini-conference on Sepsis Identification and Management. This was an opportunity to share with EMS providers and Emergency Department nurses who are first in the line of care, and the ones with the potential for early identification of septic patients. Presentations included: Sepsis in The Pre-hospital environment by Jefferson Williams,MD,MPH; The Meaning of Sepsis by Brian Quigley, MD; Management of Severe Sepsis in the ICU by Benjamin Antonio,DO; and Sepsis from The Inside Out by Gary Black, sepsis survivor and author of Gyroscope, A Survival of Sepsis. By adding the patient perspective, and hearing the reality of the devastation of the sepsis process, I hoped to provide the EMS and Emergency Department another dimension to the multi-faceted care needed for septic patients. I was invited by Phyllis McLellan, director of performance improvement, to speak at the Michigan Health & Hospital Association ICU workshop held in the beautiful Dearborn Inn ballroom. It featured presentations from local and national critical care experts on ICU survivorship, patient-centered care for delirium prevention and management, updated best practices for sepsis identification, treatment and management, navigating difficult conversations with patients and families, current approaches to palliative care and lung protective ventilation in the ICU setting. My presentation, "Sepsis from the Inside Out" offered a patient's perspective to this ICU and Sepsis collaborative. 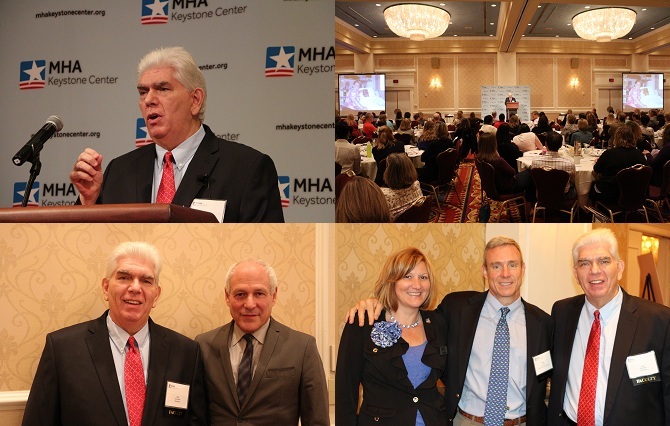 A record 400 participants from across the state attended this event. 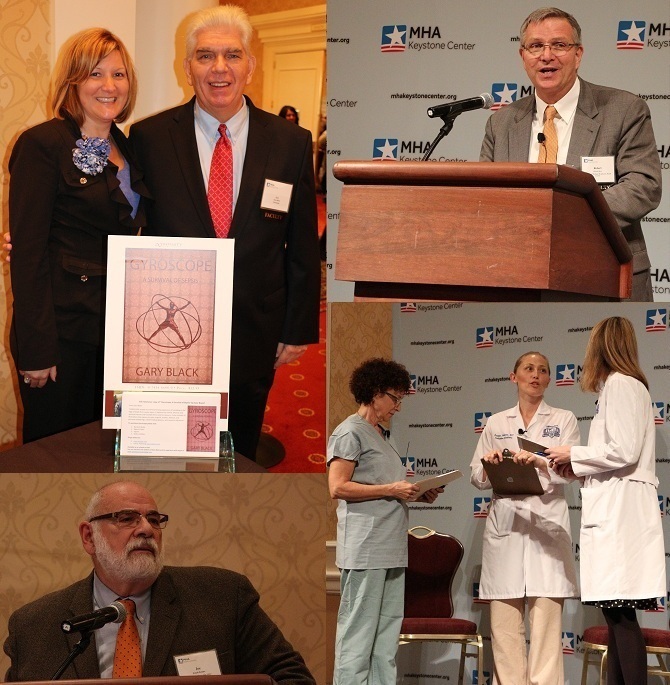 Keynote speakers were Dr. Mitchell M. Levy, and Dr. E. Wes Ely, along with Deena Costa, Phd , RN, Dr. Robert C. Hyzy, Dr. Michael Mendez, Dr. Rana L. Awdish, Dr. Dana Buick, and Dr. Joseph Bander. Robert Herriman, host at Outbreak News This Week Radio Show, AM1380, Tampa Bay area, Florida, invited me to share my sepsis experiences along with Dr. Carl Flatley, founder of the Sepsis Alliance. The show was designed to help spread the word about sepsis during September, Sepsis Awareness Month of 2016. I was invited to attend the Ribbon Cutting Ceremony to open Biomerieux's newest state-of-the-art production line which will manufacture the worldwide supply of the company's BacT/ALERT/3D blood culture bottles, which are a critical component used to rapidly identify bacteria which helps fight superbugs and bloodborne infections like sepsis. The bottles take a direct blood specimen from the patient for testing in a state-of-the-art system for rapid, accurate microbial detection. I had an opportunity to meet Biomerieux CEO, Alexandre Merieux, and Durham Americas Vice President, Stefan Willemson. I gave them both a copy of Gyroscope. Dorie Murray, sepsis coordinator in the Quality Department at Medical City North Hills invited me to share my sepsis story and discuss some of the important perspectives of sepsis, which included Definitions of Sepsis (from SIRS to current views of SOFA and qSOFA), the dimensions and role of compliance in sepsis implementation, the effects of delirium in sepsis patients, and the aftermath of sepsis and PICS (post intensive care syndrome). After my two hours of presentations, Dr. Scott Robins, Chief Medical Officer for Medical City Healthcare presented an enlightening analysis of identifying and treating potential sepsis patients. Case studies were discussed in detail. It was a privilege to speak to such a great group of physicians, nursing students, EMS professionals and registered nurses that attended.